Over the period of time, social media relevance has grown so far connecting to the mass audience, it is truly correct to state that it opens lots of tapped bottlenecks. Be it tweeter of Facebook or for that matter any other social media platform, these are widely accepted as the path to give opinion, views, and enter into the discussion of nay global topic or matter of concern. With the significant chunk of the young audience over social media, REVA university started a campaign to increase awareness about the voting rights of students. The campaign maneuvered the voting rights of students and creating awareness about adult franchise by organizing camp and skit. Creating a brand awareness about REVA University. Promoting the voting awareness campaign. Run campaigns to promote and increase awareness about voting rights of students, thereby building brand equity for REVA. Collect testimonial of director and eminent personality and post in social media. Post about campaigns on social media and blog. Publication of campaign reviews in the newspaper. Short video of “Natak” on voting rights of students published on social media. Students volunteering in cities and campaigning about voting issues. 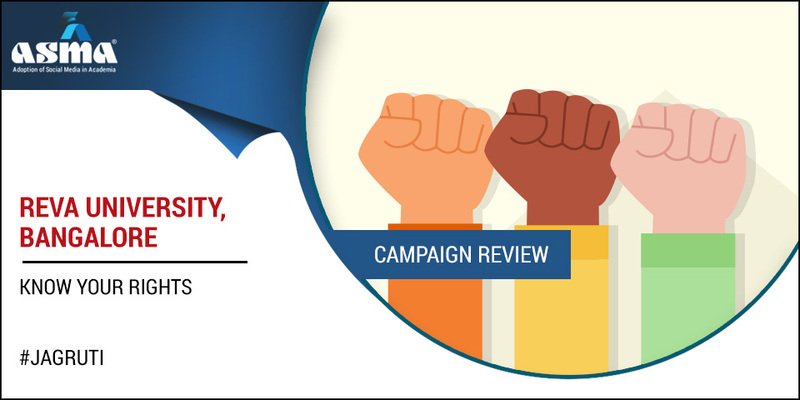 The campaign was aimed to build brand equity for REVA through a unique approach towards social issues. The strategic move to expand the horizon of the adult franchise of students, and how important it for students to know about their right to elect a right candidate. The social media footsteps have been followed to reach the target audience, transforming academic learning beyond traditional methods. The opportunities were there with increasing advent of instant gratification for visual representations and story-telling, handles on Instagram and BlogSpot need to be explored to attract more audience. There is a plethora of social issues and conflict among the society, and people only talk about it but the actual solution lies in changing the mindset of Individual. University and Institution are the most prominent source to begin changes, that’s what REVA understood and followed to aware students about their voting rights. The campaign strategy was clear to leverage the social media, they have started with posting about the campaign on Twitter. The retweets over the post were at very good level. And thereby increase the number of participants. Posts about the campaign conclusion have been shared. The cross-promotional strategy has been followed over Facebook. With more than 1 lakhs over Facebook, reaching the target audience made it easier for REVA. The success of campaign post over Facebook. Instagram has been widely used among millenniums and thereby targeting the audience over Instagram with short video actually brought the high level of engagement. Short video of “Natak (Skit)” on voting rights of students published on social media. Event Highlights, including the ceremonies and speech. How the idea was initiated and executed? How did the faculty and students vow a pledge along with the Chancellor? What was the message conveyed during the events? How melodious musical performance from School of Performing Arts on the theme song of Jagruti enthralled the audience.